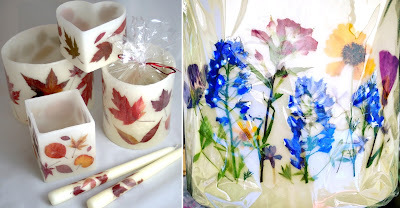 Handmade Luminaries & Candles with Natural Decoration. Pressed Flowers, Leaves & More to Give Your Candles Flair! I love meeting other mother-daughter crafting duos because it reminds me of all that my mom inspired in me. The two fantastic women behind Bee Curious Candles, Erin and Melody, create together and run a unique handmade business as a family. Their media of choice is candle making, and they've set up a full functioning studio space in their home. Their signature collection is made up of wax luminaries in varying shapes and sizes with natural embellishments, Fall leaves or Spring flowers, Summer sea shells and sprigs of holiday trees for the Winter. They collect and hand press each bud and leaf, which I imagine is half of the fun, but also half the challenge because they strive for an eclectic mix in good condition. Whatever methods they use, it works! Their leaves are always pretty and colorful, and the flowers expertly pressed! No matter the season, they have a motif that matches. 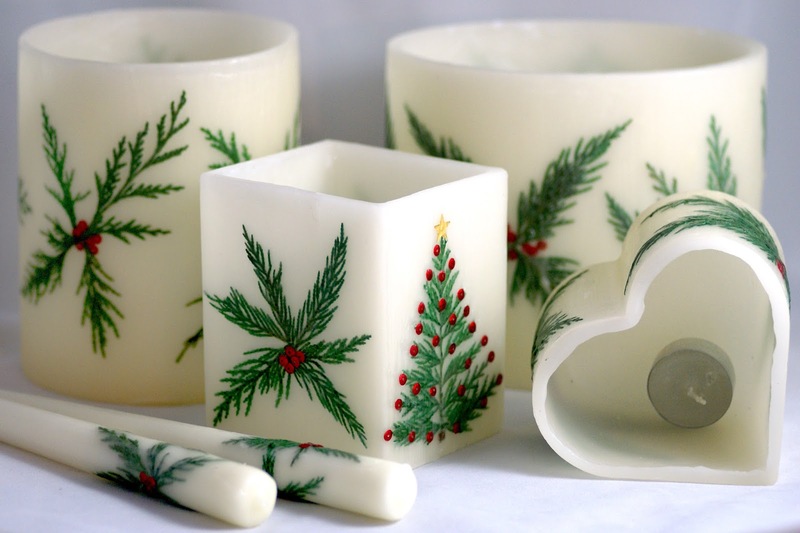 The process of shaping, decorating and then re-dipping their luminaries takes patience and attention to detail. Walking through their studio, you can see the different stations for each step of the process, and the care really shows in each hand finished item. Over the past year, they've started offering different variations of scented candles as well. While the luminaries are their specialty, they're gaining expertise in developing recipes for great aromas! I can imagine many a table scape using candles or luminaries from Bee Curious Candles. I feel like they set a whimsical, natural tone that's bright and refreshing! Every now and then they rotate in something new; I can't wait to see what types of decorations come next!